Day 1 at ISPA Expo is approaching a close. We have a few good drivers closing in on the winning time. 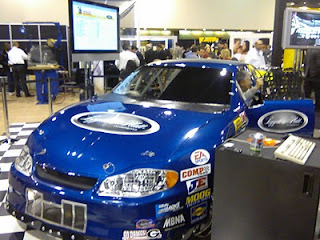 This race car simulator is very popular in the booth. There's a lot of fun with some fast paced good times. The racing contest will end on Thursday, so get in the race as soon as you can. Winners will recieve their Racing Experience prize on Thursday night at the Fan Appreciation party. GSG has some great mattress machines in Booth 2625, but I must admit this is one of the most popular.